Mine Management Systems are supplied by Wenco International Mining Systems Ltd. (a Hitachi group company). Wenco International Mining Systems Ltd. is the world’s leading manufacturer and supplier of PC based Mine Management Systems. Mine Management Systems monitor and control a mine’s mobile assets to help ensure the effectiveness of all departments. Mine Management Systems are a necessity in modern mining and a key ingredient to a successful mine. Wenco’s Mine Management System includes features and benefits ranging from reporting accurate operating information, precise positioning and machine guidance, to equipment health information and sophisticated automatic dispatching systems. 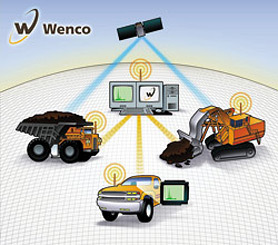 Using the latest GPS, wireless broadband communication, computer technology, and software applications, Wenco provides proven and sustainable benefits to the mining industry’s largest, most respected companies such as BHP-Billiton, DeBeers, Teck Cominco and US Steel. Wenco is an international company with offices in five countries, including North America, South America, Africa, Australia, and Eurasia.